The smartphone, which hit Indiegogo this week, offers a two-pieced backing that can be made from two different materials (out of several options) and a customized leather wallet case. The smartphone itself will have midrange specs. Phones these days typically look the same. Most are a candy-bar style form factor with a single color glass, metal, or plastic back. As such, they tend to blend into the crowd and may not stand out. 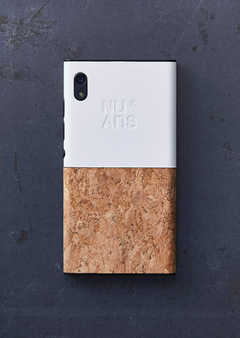 A new startup, NuAns, is looking to challenge this design language with their upcoming NEO [Reloaded] smartphone. The NEO [Reloaded] is currently seeking crowdfunding on Indiegogo, but the concept is interesting. The back of the phone’s case has two pieces that slide together. NuAns calls this their TWOTONE case system and says that users can mix and match colors and materials to make over 600 cover combinations. Materials range from basic plastic to corkboard to denim to rubber to different types of wood. The pieces are also removable, allowing users to access the battery for a quick swap if the phone dies. NuAns even advertises placing a credit card under the back cover for easy and discreet storage. NuAns is also selling a FLIP wallet cover that “attaches directly to the NuAns NEO, blending in perfectly to the CORE.” The FLIP can hold two cards and has a “large storage pocket” and can be used as a stand for the phone in landscape. Is this phone going to break new ground in the mobile market? No. We’ve seen these specs before in much cheaper phones. While the Moto G5 retails for about $250, the NuAns NEO will retail for about $480 when/if it actually goes on sale, but early backers can lock in their order for a pledge of $360. This includes the CORE and either a set of TWOTONE casings or a FLIP case. The NEO looks interesting, but other companies have made their phones available with cases made from exotic materials in the past. Motorola was known for offering its Moto X flagship with options for wood, leather, nylon, and other materials for the back case. Companies like D-Brand also sell skins that simulate the look and feel of materials like marble and stone. If you’re interested in a the NuAns NEO [Reloaded], you can visit their Indiegogo page here.